LEFT Rogier Spoel of EVO FENEDEX, Middle Steven Lak Chairman EVO FENEDEX, Right Fer Penders Managing Director “K” Line (Nederland) B.V receiving the Award. It was announced that “K” Line has been selected by EVO FENEDEX* as the winner of the Container Liner Shipping Award 2017. 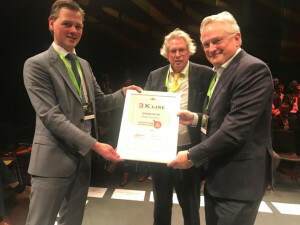 It is the second time in the 6 years of instalment of this award that “K” Line has been chosen by Dutch Shippers/Entrepreneurs as the best performing Shipping Line. The selection of the winner of this Award is done by the Shippers/Entrepreneurs based on 26 criteria leading to the best performance this past year. Important business items as availability, reliability and accuracy are the most important criteria for the service provided by the shipping companies. “K” Line achieved the highest scores for these criteria and is therefore allowed to call itself “Shipping Company of the year 2017”. According to EVO FENEDEX it is striking that “K” Line also received the highest scores in the field of digitization and data exchange. EVO FENEDEX sees proof that by means of investments in data exchange a better performance can be achieved and delivered with respect to reliability and accuracy. Digital Exchange of Data between parties in the chain creates lesser opportunities for errors and shorter procedures which increases reliability and accuracy. * EVO Fenedex is an Entrepreneurs association, a network of Dutch Merchant and Production Companies with a Logistic and International operation.